Mbola Hanjakazaka Amin'ny Fifidianana Hatrany Ve ny Antoko Nitondra Tao Malaizia Nandritra ny 50 taona? Lohahevitra nanakoako tamin'ny Fifidianana Ankapobeny faha-13 notontosaina ny 5 mey 2013 tao Malaizia ny fikaroham-piovana, na ‘ubah’ (ova amin'ny teny Malay). Misy teny filamatra malaza miverimberina manao hoe ‘ini kalilah, ubah’ izay midika hoe ‘manodidina izao fotoana izao, manatona ny fiovana’. I'm not one for politics. I detest it actually, it makes me more emotional than almost anything else. I'm so easily roused by anger when I read about prejudices, dirty tricks, unjustified behaviour, corruption. Everything that is humanely destructive but equally bracketed into the flawed mortality of individuals I'm entrusting my country with. But don't you think we should have a choice? A two-party system so we have the ability to choose if the government is corrupt? Isn't that what democracy is all about? Not being shushed or silenced because ‘they have done so much things for us’. Yes, they have done things for us, but they're our government. It's, I'm sorry to be blunt, their job. Tsy natao ho amin'ny politika aho. Mankahala azy aho no tena marina, mahatonga ahy ho mora mihetsi-po kokoa io noho ny zavatra hafa. Mora tratran'ny fahatezerana aho raha vao mamaky lahatsoratra ahitana fitsaratsara-poana tsy misy famotorana, fitapitaka maloto, fihetsika tsy azo hamarinina, kolikoly. Mihapotika araka ny maha-olombelona ny zava-drehetra saingy potika haingana kokoa noho ireo olona nitokisako hitondra ny firenena. Saingy tsy mieritreritra ve ianareo hoe tokony hanana safidy isika? Ny rafitra antoko roa mba ahafahantsika misafidy raha mpanolikoly ny governemanta? Tsy izany moa no atao hoe demokrasia? Tsy “shushed” na nampanginina satria ‘nahavita zavatra maro dia maro ho antsika ry zareo’. Eny, nahavita zavatra ho antsika ry zareo, fa ireo no governemantatsika. Miala tsiny aho raha mivanta-piteny, fa asan-dry zareo izany. Mandrisika ny mpamaky azy ihany koa i Glam mba hifidy ny fiovam-pitondrana, ka ataony amin'ny alalan'ny lahatsary maro izany. Namoaka ny lahatsarin'ny mpifidy ao Penang ihany koa i Anil Netto miantso ny isian'ny fiovana eo amin'ny firenena ihany koa. The people have made up their minds. This wasn’t about the people calling for tunnels, new highways and more high-rise luxury condos; it was the about the people calling for an end to corruption in the country and for political change at the federal level. Efa manana ny heviny ny olona. Throughout the country, on the numerous BN’s billboards, printed materials and TV commercials and news, it is Najib’s sweet and gentle smiling face that you see. Never before in the history of general elections in our country has so much been hinged on the persona of a man instead of on the ideals or vision of the party for the country. But Najib Razak is a trojan horse, constructed by professional public relations firm like APCO with the help of a very compliant broadcast and printing mass media industry. He has had an extreme makeover which transformed him from an ultra Malay rights politician to one that espouse the inclusive and tolerant values of 1Malaysia. Manerana ny firenena amin'ireo takelaby lehibe an'ny BN, na amin'ny zavatra natao printy na doka sy vaovao amin'ny fahitalavitra, dia ny tsiky malefaka sy mahafinaritr'i Najib hatrany no hitanao. Hatramin'izay teo amin'ny tantaran'ny fifidianana ankapobeny nitranga teto amin'ny firenena tsy mbola nisy fanandratana olona fa fanandratana idealy na vinan'ny antoko ho an'ny firenena . Saingy soavalin'i Troà i Najib Razak, natsangan'ny orinasam-pifandraisana aman'olona matihanina tahaka an'i APCO sy ny fanampian'ny orinasam-pampielezam-peo sy sary mbamin'ny gazety an-tsoratra famakin'ny besinimaro mpiray donak'afo aminy. Tonga any amin'ny faratampony ny fanamboamboarana natao taminy ka manova azy izay politisiana mpandala fatratra ny zon'ny Malay ho iray amin'ireo mpankasitraka ny soatoavin'ny 1Malaysia ho amin'ny tsy fanavahana sy ny fahazakana [ny hafa]. As I write this post the sun is rising in Malaysia on a new day and I will be going to bed soon because it is the end of the day in the UK. There is something ironic about that. I left Malaysia 32 years ago and although I now live thousands of miles away I am excited at the prospect of ‘Ubah’ (‘change’ in the Malay language)becoming a reality on 0505. 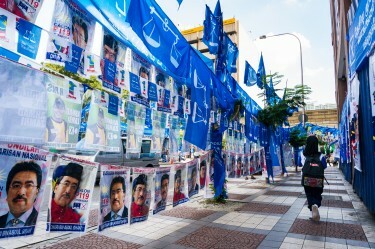 The election or GE13 as it has become known, I suspect, will be a political milestone for the manifestation of Malaysian unity all over the world. I don't think I am alone in hoping for Ubah while living in a foreign land. You may wonder why this is important for someone who does not experience daily life under a regime that many Malaysians experience as being corrupt and authoritarian. I may not live there now but I did live the daily life of state-led grind for many years. Amin'izao fotoana anoratako izao dia miposaka ny masoandro ao Malaizia ary andro vaovao no handehanako matory satria takariva izany eto Angletera. Misy zavatra mampihomehy mifandaka ihany ao anatin'izany. Nandao an'i Malaizia aho 32 taona lasa ary na dia an'arivony maily lavitra aty aza no misy ahy dia mientanentana aho mba hitranga tokoa ny ‘Ubah’ (ova amin'ny fiteny Malay) ao amin'ny 0505. Lasa fantatra ny fifidianana na G13, manahy aho fa ho dingana ara-politika ho amin'ny fampisehoana ny firaisana Malaiziana manerantany. Tsy mino aho hoe izaho irery no manantena fiovana raha monina an-tany vahiny. Mety ho azonao vinaniana ny halehiben'izany ho an'olona iray izay tsy miaina ny andavanandrom-piainana entin'ny fitondrana heverin'ny Malaiziana maro ho mpanao kolikoly sy didiko fe-lehibe. Mety hoe tsy monina any aho fa efa niaina nandritra ny taona maro ny fiainana tarihin'ny fanjakana. Namoaka lahatsary momba ny fifidianana amin'ny alalan'ny paositra izay notontosaina herinandro alohan'ny 5 mey ao Melbourne ny JOM Magazine, gazety-boky izay mitodika any amin'ny fiaraha-monina Malaiziana. Noho ny fampiasan'ny olona amin'ny ankapobeny ny tambajotran-tserasera dia tsy mahagaga raha nomena anaram-bositra hoe fifidianan'ny tambajotran-tserasera ity fifidianana ity.